If you have read my previous posts then you know that I received my Influenster Box.. and inside were a set of Kiss Nail Dress Appliques!.. I could not wait to use them... so i tried them last night.. and let me tell you.. I absolutely love them. Ive always seen these in stores but never really thought about it, mainly because I am so use to painting my nails every week and i have a lot of nail polishes i didn't see the need of having these. Well i am grateful i had the opportunity to try them because they are so simple and quick.. just perfect for those days i am too lazy to paint and wait for my nails to dry. *Please read on for a more detailed review and pictures! Inside the plastic packaging was a nail filer and the set of "stickers" covered in plastic. This product comes with 28 stickers.. Just enough in-case you mess up or want to cut up the extras to add a little twist to your nails.. or regular nail polish routine. You can also save the extra's and use them next time. That's another great thing about them.. they don't dry up like other brands!.. They can be used on your finger nails and toe nails!.. How cool is it that you can use them on your toes.. no more worrying about whether your shoes will mess up your pedicure! At first when i saw this in my box.. i was excited to try them.. but i honestly thought they were too bold for me. If you follow my nail art posts.. then you should have noticed that i don't do anything too bold. What made me excited to try these were, for one: its something new to me, two: I noticed how pretty the metallic gold color was and three: I needed to try something out of my comfort zone. At first i had a problem with taking the product itself off of the plastic they were sticking on as well as placing it evenly on my nail.. it would either not cover one side of my nail fully or have "bubbles/bumps".. so it took me a while to adjust and get use to applying it. Once i had the hang of it.. it was pretty simple and easy to use. Honestly, if i didnt stop to take pictures or record a video.. it probably would have taken me 10 minutes to do my manicure and after getting use to it and trying other designs i am sure it will take me 5 minutes =). This is how long it took me to do my index finger.. starting from trying to take it off the plastic. ... and this is how long it took me to do my middle finger after already having the sticker ready. Here are 2 versions.. one without the rhinestones and the other with =).. I personally like it with the rhinestones.. i feel like it completes the look. On my right hand i did the accent nail on my index finger and on my left hand i did it on my wedding finger. You can see the many designs they have.. i can't wait to try them! There are a few more designs i would love to try.. which include the lace one, gold jewels, snake skin, floral, and zebra.. wth.. just say all of them!! haha.. 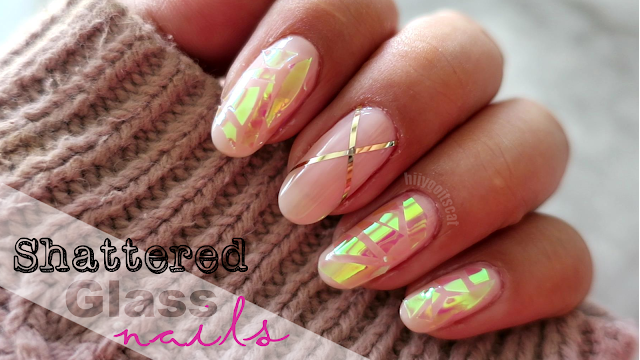 The 2nd picture shows you how to use them to make a different "nail art/design" on your nails. Which i love that they included.. because it just shows people that they can use them in different ways.. instead of just a single all over the nail use. ♡Where can you buy them? I recommend looking around at your nearest drugstores.. they vary by price but should be around $6.99.. and sometimes they have a buy one get one half off deal! I give this a 5/5... it is great a great product for people on the go.. but like to have polished nails. honestly is quick and easy.. i will update this post on the lasting power.. It is stated that it can lasts up to 10 days.. so i will update with pictures and lasting power! You can see that it's starting to wear at the tips of my nails.. and i can only see that it will keep wearing till the full 10 days.. but you can always fix it buy filing it down =).. and it will look as though you just put them on again.. and you can probably wear them for about 4-5 extra days. Disclaimer: All products were provided for free through the VoxBox product testing program by the Influenster Team. Thank you again for introducing me to this lovely product!! I really do love it.. to find out more about Kiss Nails please visit them on FB HERE/@KissProducts.. & please do the same for Influenster HERE/@Influenster.. &/or visit my previous Influenster post Here. I hope you enjoyed my review on this product. Yay! Glad it was easy to apply. I've tried the Sally Hansen ones and the Incoco ones (received Incoco in one of my BirchBoxs). So far the Incoco ones actually lasted 10-14 days. So I will be really interested to see how long the ones you have on last. Hello! I got your blog link off of the Influenster Facebook page and I thought I would drop by and say hi. I am a new follower, check out my blog and follow back?